The effect of fungi within the home is often underestimated. Fungi able to produce spores into the atmosphere are present indoors in a variety of places such as the carpets, wallpaper and other soft furnishings, including sheets and blankets that contain natural fibres, as well as discarded food, pet food, pet cages and other bedding materials. Fungi that cause dry rot of the timber frames and panelling of houses also produce a great many spores (see Chapter 13; CLICK HERE to view the page). These fungal spores are dispersed around the home by foot traffic and general air movements. Common mould fungi can also colonise large areas within water-damaged buildings, forming visible indoor mould on a variety of materials but particularly timber and materials containing cellulose such as wallpaper and ceiling tiles. Several studies of the fungal spore content in dust collected from carpet and air samples within the home show that about half the houses tested had spore densities exceeding 500 CFU m-2 (CFU = colony forming units). Generally, mould spore concentrations were higher in kitchens than in rooms more likely to be carpeted. The most abundant genera were Cladosporium, Penicillium, Aspergillus and Stachybotrys (all filamentous Ascomycota). Of these, Stachybotrys chartarum is a particular threat. Patients suffering building-related symptoms, often called ‘sick building syndrome’, though it now tends to be called Damp Building-Related Illness (DBRI), and infants with lung disease (specifically ‘infant pulmonary haemorrhage’) often have histories of living in mouldy, water-damaged buildings. These illnesses have been attributed to mycotoxins released by Stachybotrys chartarum, inhaled as spores or as mould-covered material. Stachybotrys produces trichothecene (see Chapter 10; CLICK HERE to view the page) mycotoxins known as satratoxins, which can lead to pathological changes in animal and human tissues because they are potent inhibitors of DNA, RNA, and protein synthesis. Stachybotrys also produces the haemolysin, stachylysin, which lyses sheep erythrocytes and may contribute to animal disease. Controlled human exposure studies have shown that exposure to volatile organic compounds (VOCs) from indoor mould can cause irritation of the respiratory tract (Pestka et al., 2008). Up to 300 different compounds have been detected in indoor air, including 3-methylfuran (C5H6O; 3-MF), which is a suspected neurotoxin. Because it is a common volatile product of many common fungi, 3-MF and can be used as a marker for the active growth of fungi in water-damaged buildings; the substance has a characteristic ‘musty fungus’ smell, as does another common fungal metabolite 2-octen-1-ol (CH3(CH2)4CH=CHCH2OH). 3-MF may contribute to pulmonary diseases and is known to cause acute irritation of the eyes, nose, and airways; it could be a contributor to sick building syndrome. Though the degree to which volatile compounds influence human health issues is currently poorly understood, it is evident that the most important sources of volatiles in the domestic environment included cigarette smoking, vehicle-related emissions, building renovation, solvents, household products, and pesticides (Wålinder et al., 2005; Chin et al., 2014). What is lacking in this area, however, is a causal link between the fungus and the reported illness. Also, it is not clear that the attention given to Stachybotrys is justified; it is only one of the contaminants inhabiting buildings and, indeed, it is less common and usually occurs in lesser amounts compared to the genera Aspergillus, Penicillium, Alternaria, and Cladosporium, all of which are isolated more frequently from buildings with sick building syndrome. Interest was focussed on Stachybotrys originally by an alleged association between this fungus and an outbreak of infant pulmonary haemorrhage in a group of infants in Cleveland, Ohio during January 1993 to November 1994, but later analysis showed that the data were misleading and the ‘association’ was not statistically significant; other factors such as cigarette smoke exposure emerged as potentially more relevant and the conclusions of the original investigation were retracted. The situation remains that whilst it is clear that Stachybotrys chartarum produces toxins and can cause disease in animals, it is not proved to be able to produce symptoms in humans. As S. chartarum is among the least common of the fungi found in the home, it is likely to be a localised rather than widespread problem. Most studies, including Ochiai et al. (2005), agree that fungi in the home can affect individuals who suffer from allergies or who are immunocompromised; whether the fungi cause disease in healthy, immune-competent individuals at the exposure levels encountered in the domestic environment is a matter of debate. Perhaps prevention is better than cure, whilst the debate continues, particularly for those susceptible to allergy or illness. The home should be kept well ventilated and should be vacuum-cleaned regularly. If the environment is damp a regularly-cleaned dehumidifier should be used, any water leaks should be repaired immediately, and visible mould removed and the area treated with antiseptic (Cheong et al., 2004; Cheong & Neumeister-Kemp, 2005). Allergic reactions are certainly important and severe for the sufferer, as is illustrated in the Resource Box below. … on Monday, a passenger on a Ryanair flight from Budapest to Dublin needed medical treatment after a jar of soup leaked in an overhead locker, dripping onto his face. The man suffered swelling to his neck and struggled to breathe, forcing the aircraft to be diverted to Frankfurt, in Germany. Yesterday, Ryanair said the leaking jar had contained a “vegetable oil/mushroom soup type substance” which had caused an allergic reaction. The Boeing 737 was delayed for two hours while doctors treated the man. This is a quotation from a newspaper article extracted from The Guardian website at https://www.guardian.co.uk/. Written by James Orr and agencies guardian.co.uk, Thursday August 28 2008 09:53 BST. It is archived at https://www.theguardian.com/business/2008/aug/28/ryanair.theairlineindustry. Several studies suggest an association between amounts of fungal spores and visible mould and asthma in children and adolescents. One study predicted that about 5% of individuals will suffer some allergic symptoms from exposure to moulds during their lifetime. Overall, 10-32% of all asthmatics are sensitive to fungi, though this is significantly less than the proportion sensitive to pet or mite allergens (Hossain, Ahmed & Ghannoum, 2004; Ochiai et al., 2005). Allergic reactions require prior exposure to the fungal antigens and can then rapidly reoccur on re-exposure to small amounts of the same antigens. A superficially similar reaction is Organic Dust Toxic Syndrome (ODTS), but this follows a single exposure to large amounts of particulates contaminated in some way with fungal material. This syndrome is not mediated by the immune system, being due to the direct toxicity of the acute respiratory burden of fungal particulates. It is mainly an occupational disease, the risk groups being workers renovating contaminated buildings or those involved in fungal remediation programmes. Evaluating building-related symptoms can involve skin-prick testing with fungal and other likely antigens; this test is based on the proposition that symptoms should occur when the presumed cause is present and abate when the cause is removed. Any sort of organic dust can cause similar health issues; fungi are not the only culprits. There can be a considerable load of bacteria in floor dust, as well as fragments of fungal hyphae and fungal spores. The growth of these microbes is often favoured by characteristics of the dwelling and nearby outdoor environment, but there is still a close dependence on humidity levels (Baumgardner, 2016; Dannemiller et al., 2016). Almost all episodes of real human illness due to fungal toxins have been caused by ingestion of the toxin. There are more than 100 toxigenic fungi and over 300 different mycotoxins produced by them, but only two mycotoxins have been shown to be carcinogenic (Bennett & Klich, 2003). We associate drama and tragedy with mushroom poisoning though, in fact, fewer than fifty of the more than 2,000 thousand species of mushrooms which occur commonly in most countries can be considered poisonous, and only about six are deadly. Most serious poisonings are due to species of Amanita which contain two of the most potent toxins known, cyclic peptides called amatoxin and phallotoxin. Amanita phalloides, is aptly named Death Cap because it accounts for more than 90% of mushroom poisoning fatalities in the United States and Western Europe, and the other deadly species is Amanita virosa (the common name for which is the Destroying Angel). Both of the toxins interfere with basic aspects of normal cell biology. Amatoxins bind to the RNA polymerase enzyme and inhibit mRNA synthesis, so the cell cannot function properly and eventually dies. Body organs which normally have high rates of protein synthesis are particularly sensitive to this toxin. Liver hepatocytes are in this group and are most commonly involved in mushroom poisoning, but other target organs include kidney, pancreas, testes, and white blood cells. Phallotoxin causes irreversible disruption of the cell membrane and cytoskeleton and cell death inevitably results. Phallotoxin is not absorbed from the human gut, so is not thought to be responsible for the symptoms associated with human poisonings. Amatoxins are readily absorbed from the gut and are then concentrated in the liver where they do their damage. A patient poisoned with Amanita goes through four characteristic phases. For the first 6 to 24 hours the patient is free of symptoms; then there’s a 12 to 24 hour period of severe abdominal cramps, nausea, vomiting, and profuse watery diarrhoea. In this stage patients are often misdiagnosed as having gastric influenza, and as the patient’s gastrointestinal symptoms improve in the third 12 to 24 hour period this misdiagnosis may seem to be right as the patient appears to be on the way to recovery. But all through this time the toxin is destroying the liver; killing hepatocytes and literally ripping it apart from within. Symptoms of liver damage only appear 4 to 8 days after the toxin was consumed, but the liver damage can progress rapidly, accelerating all the time. Death from catastrophic failure of the liver can occur anything from 6 to 16 days after the fatal meal was consumed. Providing misdiagnosis can be avoided; providing liver function is monitored, and providing proper supportive care is made available, the patient has a fair chance of surviving the poisoning. In the long run, though, this may require a liver transplant and even with the best medical care, death still occurs in 20 to 30% of cases and there is a mortality rate of more than 50% in children less than ten years old. Most people who eat a poisonous mushroom suffer an unpleasant but relatively mild and short lived bout of ‘food poisoning’. The quicker that symptoms arise, the less severe is the attack. The toxins of deadly mushrooms are slow acting and do not cause symptoms for 6 to 12 hours or more after eating. Those causing milder poisonings make people sick in 2 hours or less. After a few hours discomfort, vomiting, nausea and cramps, accompanied by diarrhoea, the victim recovers completely. People at most risk of being poisoned through eating wild mushrooms are toddlers, who are likely to eat anything on an experimental basis; recreational drug users, who think that any trip is worth a try; and immigrants who are in danger of collecting toxic mushrooms that resemble species that are safe to eat in their home regions. Mushrooms are not the only fungi able to produce toxins which have plagued humanity over the years. Imagine a disease whose victims feel as if they are burning up, literally on fire, or as if ants, or even mice, are crawling about beneath their skin. Imagine that, as the disease develops, they may suffer terrible hallucinations; so bad as to sometimes drive them insane. If they avoid the hallucination and madness an even greater suffering awaits. After a few weeks limbs become swollen and inflamed, violent burning pains alternate with feelings of deathly cold and gradually the affected parts become numbed, then simply fall off the patient’s still living body. Fingers, toes, hands, feet, arms and legs, all may separate from the body and rot away. At intervals throughout the following centuries there were epidemics in which an enormous number of victims died. One bad outbreak in France in 944 AD reputedly killed 40,000 people; the last epidemic of any considerable extent was in the 1880s. Records in the eleventh and twelfth centuries refer to this plague as holy fire, but it became associated with St. Anthony, as those suffering from the disease started to visit the saint’s relics to seek relief and solace in faith. Most cases of what therefore became known as St. Anthony’s fire occurred in France and its distribution reflected the cultivation of rye and use of the grain to make bread. The human disease is caused by eating bread prepared from rye which is itself suffering a fungal disease. 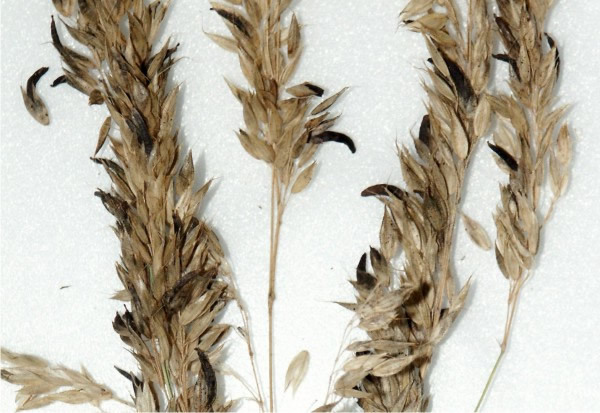 The plant disease, called ergot, is caused by Claviceps purpurea which is parasitic on wheat, rye and other grasses. As it is most common on rye it is often called ergot of rye. Spores infect the flower; the spore germinates on the stigma and then grows into the ovary. There it uses the nutrients intended to nourish the seed to produce a curved mass of compacted cells (the sclerotium) in place of the seed. When ripe, the sclerotium projects from the head of the rye as a hard purple to black, slightly curved thorn (Fig. 12). Ergot is the French name for the spur on the foot of some birds which the sclerotia resemble, hence the common name of the disease. In wild plants, these sclerotia fall to the ground in autumn where they over winter and germinate in spring to infect the next generation of plants. But on farms the sclerotia are harvested and milled with the grain. The flour then becomes contaminated with the toxins the sclerotia contain. Fig. 12. Ergots of Claviceps purpurea on wild oat, Avena fatua. Photograph by David Moore. Ergot yields at least three groups of nitrogenous organic compounds (‘alkaloids’): ergotamines, ergobasines and ergotoxines which have now become medically important (Tudzynski et al., 2001). The pharmacological effects of the various ergot alkaloids and their derivatives are due to the structural similarity of their tetracyclic ring system to natural neurotransmitters such as noradrenaline, dopamine and serotonin. Ergotamines and ergobasines excite smooth muscles (which control the uterus, blood vessels, stomach and intestines) and are now used to promote contractions of the uterus in childbirth, to stem haemorrhaging and to control migraines. The third group, ergotoxines, have an inhibitory effect on those parts of the nervous system that affect mood and emotional state, and are used to treat psychological disorders such as delirium tremens and hysteria. The use of ergot as a clinical drug has been recorded from the sixteenth century, when the ergots themselves were used by European midwives to induce labour and to terminate unwanted pregnancies. Ergot poisoning, now known as ergotism, causes two groups of symptoms which are manifestations of the same type of poisoning, gangrenous and convulsive ergotism. The former was frequent in certain parts of France, the latter occurred mainly in Central Europe. The convulsive form results from ergot poisoning combined with a deficiency of vitamin A, probably itself caused by a lack of dairy produce in the diet. In gangrenous ergotism it is constriction of the blood vessels, especially to the extremities, which eventually causes gangrene and death. In convulsive ergotism the effects of the ergot alkaloids on the nervous system are most pronounced. Twitching, spasms of the limbs, and strong permanent contractions, particularly of hands and feet. In severe cases the whole body is subject to sudden, violent, general convulsions, all coupled with hallucinations and visions. Ergotism has been suggested by some to explain the convulsive fits which took hold of eight young girls in Salem, and led to the witch trials of 1692, during which nineteen people, mostly women, were pronounced guilty of witchcraft and hanged. Britain has been singularly free from ergotism. There is only one record of typical gangrenous type, in the family of an agricultural labourer from near Bury St. Edmunds, in 1762. Mother and five children all lost one or both feet or legs: the father suffered from numbness of the hands and the loss of finger nails. Recognition of the disease, improvements in grain preparation and, especially, the introduction of antibiotics in the latter half of this century to control the bacterial infections have all helped to remove human ergotism from our catalogue of miseries. The only UK epidemic occurred in Manchester in 1927 among Jewish immigrants from Central Europe, who lived on bread made from a mixture of wheat and rye. All two hundred suffered symptoms of mild convulsive ergotism. At the same time, September 1926 to August 1927, and perhaps because the grain came from the same source, there were twelve thousand cases of convulsive ergotism in Russia. The last recorded outbreak, in France in 1951, caused more than two hundred people to suffer from hallucinations, and five died. One young victim believed she saw geraniums growing out of her arms. But ergotism in livestock remains a common problem arising from the ergot infection of fodder grasses. Sheep suffer from inflammation and ulceration of the tongue. In cattle, the symptoms are lameness and dry gangrene in the feet, and at times the whole foot can be lost. One final fungal toxin worth a mention, and certainly worth avoiding, is aflatoxin. There are several related aflatoxins, which are produced primarily by the moulds Aspergillus flavus and Aspergillus parasiticus. They are considered to be the most active carcinogenic natural substances known; the most important of the group is aflatoxin B1 (AFB1), which has a range of biological activities, including acute toxicity, teratogenicity, mutagenicity and carcinogenicity (McLean & Dutton, 1995). These toxins arise in crops like corn, peanuts, and to a lesser extent rice and soybeans, even before harvest, but particularly when stored under the warm and moist conditions which permit growth of the infesting fungi. This is a problem in developing countries, especially throughout tropical Africa, and the South East of the United States (Kumar et al., 2016; Umesha et al., 2017). When the tainted crop is eaten, the aflatoxin is absorbed and metabolically activated by liver enzymes. In order for, say AFB1 to exert its effects, it must be converted to its reactive epoxide by the action of the mixed function mono-oxygenase enzyme systems (cytochrome P450-dependent) in the tissues, particularly the liver. This epoxide is highly reactive and can form derivatives with several cellular macromolecules, including DNA, RNA and protein. Activated aflatoxins kill hepatocytes, which can cause hepatitis, or transformation into cancerous growths. The human liver has a fairly slow metabolism, so susceptibility to acute poisoning is relatively low. Animals are more in danger, particularly poultry. In the 1960s one hundred thousand turkeys died on poultry farms in England. The disease was unknown at the time and first became known as turkey X disease. It was eventually found to be due to contaminated poultry feed and this costly event initiated aflatoxin research. More serious to humans is that prolonged exposure causes primary liver cancer as well as other cancers. Aflatoxin health risks (collectively referred to as aflatoxicosis) differ considerably around the world. Regions with a warm, humid climate generally favourable to mould growth and with poor regulatory and control systems may have as much as 500 times higher incidence of liver cancer than is common in developed countries. The European risk comes mainly from importing contaminated foods (often nuts) and animal feeds. Aflatoxin can enter the human food chain from such contaminated feeds. Grains, peanuts, other nuts and cottonseed meal are among the foods on which aflatoxin-producing fungi usually grow. Meat, eggs, milk and other edible products from animals that consume aflatoxin-contaminated feed are also sources of potential exposure to humans. During January-June 2004, an aflatoxicosis outbreak in eastern Kenya resulted in 317 cases and 125 deaths. The Kenyan outbreak followed a poor harvest of maize that had been damaged and made susceptible to mould by drought. Furthermore, to guard against theft of the meagre harvest, people stored the maize in their homes, which were warmer and moister than the granaries where it was usually stored. From January to June 2004, 317 people sought hospital treatment for symptoms of liver failure, and 125 died. Health officials ruled out viral liver diseases; suspecting acute aflatoxin poisoning, they examined maize samples and found aflatoxin B1 concentrations as high as 4,400 ppb (parts per billion), which is 220 times the limit for food and comparable with contents measured in other acute aflatoxicosis outbreaks (Azziz-Baumgartner et al., 2005; Lewis et al., 2005). Aflatoxins and other mycotoxins contaminate 25% of agricultural crops worldwide and are a source of morbidity and mortality throughout Africa, Asia, and Latin America. Control of aflatoxin is restricted to physical separation and destruction of contaminated batches, partial decontamination, and prevention of further contamination by provision of good storage conditions. Procedures that try to remove aflatoxins are generally inadequate so the best chance of making sure that foods and feeds are free of aflatoxins is by preventing mould infestation and toxin production in the first place. Condensation of moisture on roofs and walls, leaking roofs, seepage of water into warehouses and the like are some of the causes of mould growth during storage. Every place where moisture can get to the product and cause mould growth must be eliminated. Refrigeration and climate control is useful. Reducing the oxygen concentration (to less than one percent) and increasing the carbon dioxide (to above 20%) can also inhibit mould growth. Sadly, all of these measures are costly and since huge tonnages of aflatoxin contaminated produce come from developing countries in the tropics, most of these desirable storage measures are completely impracticable. We have to fall back on continued vigilance (Umesha et al., 2017).